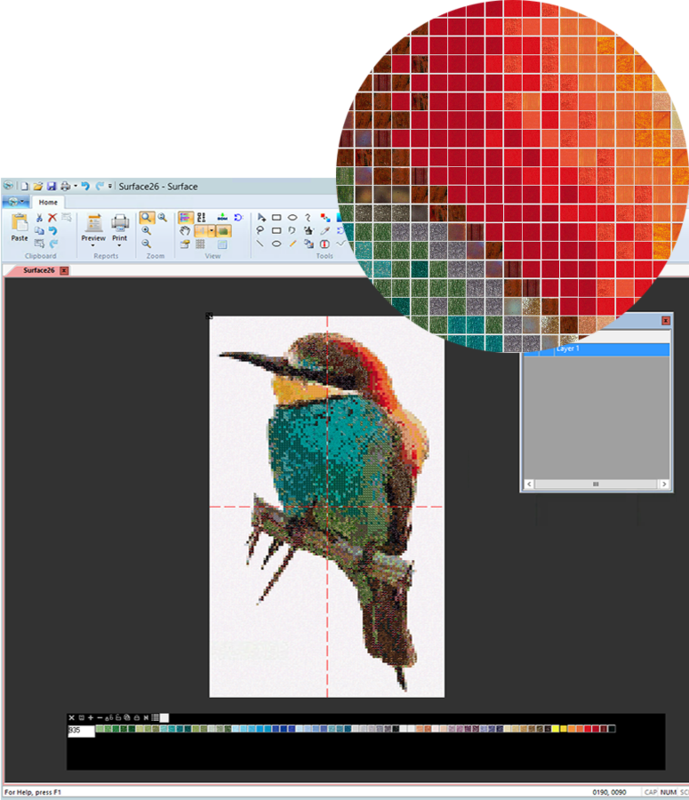 Surface provides all the tools necessary for the creative needs of the mosaic, from the presentation with the various design functions to the printing with complete reports of specific information for laying the sheets. 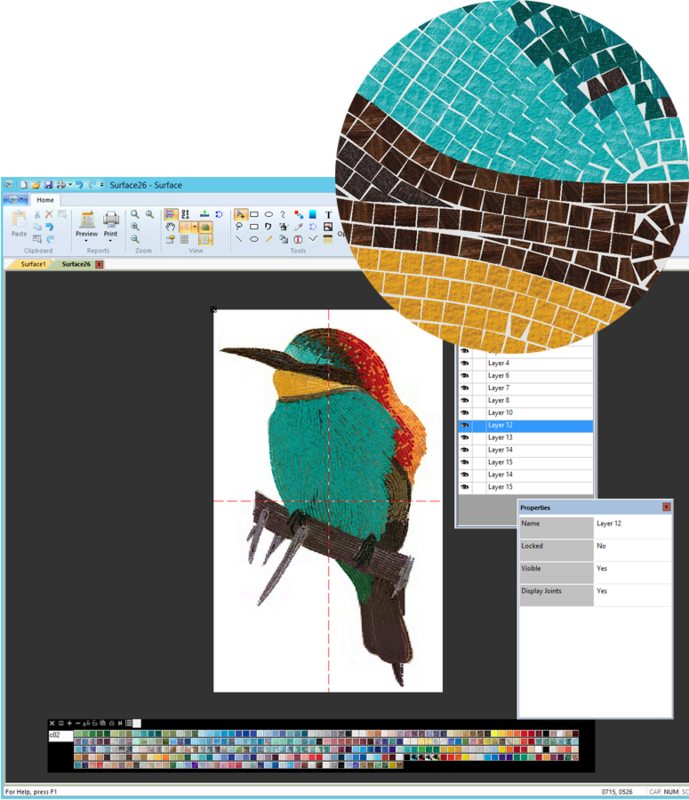 Our strength is the integration of orthogonal mosaic and artistic mosaic in a single software.  Orthogonal mosaic: characterized by a fixed grid. 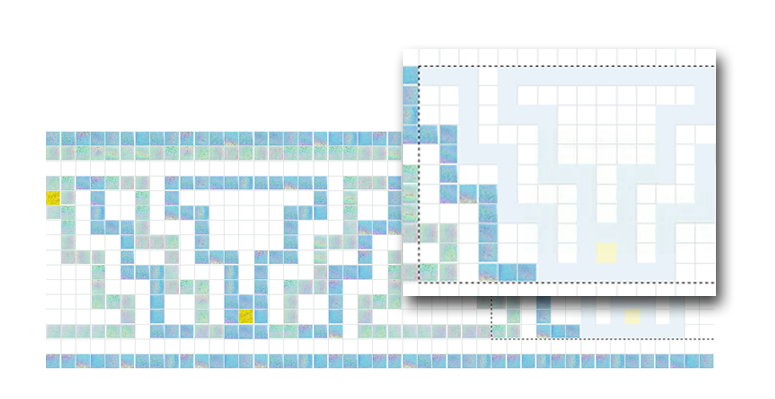 Artistic mosaic: supported by a vector algorithm that allows the tiles to be freedom in the sheet and in the dimensions. According to a management of levels it is possible to combine the two mosaic techniques, which is why many companies in the sector, Italian and international, have chosen Surface. 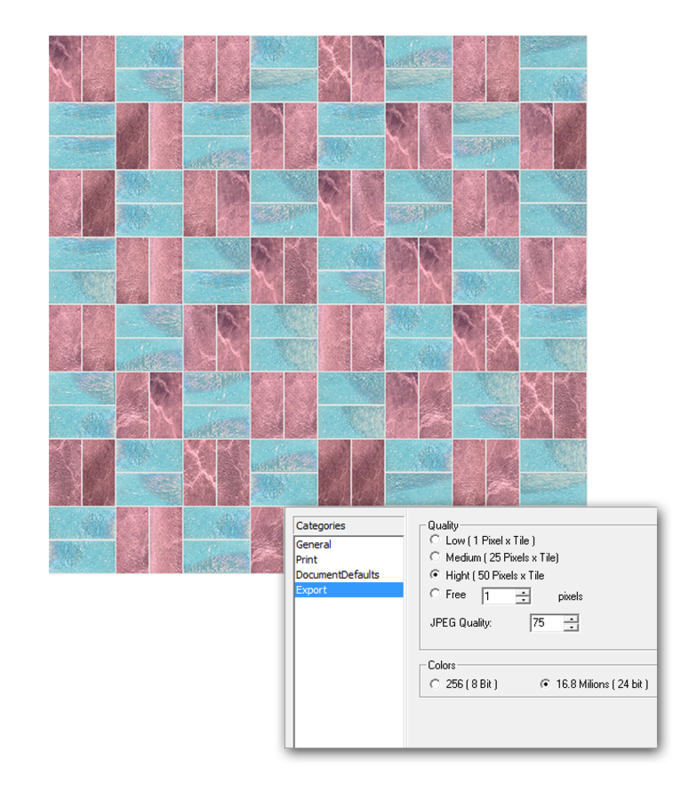 The vector algorithm with which has been developed Surface Mosaic Design Software allowes the manual drawing of single tiles and their free disposition in the grid. The Artistic mosaic gets relize in drawings which are often characterized from sinuous trends, for that it requests the manual cut in the final pose. The ortogonale mosaic is arranged with tiles side by side or staggered according to a fixed grid, whose measure is established from manufacturing companies, normally 20x20mm or 10x10mm for tiles. On demand any tile dimensions could to be insert to create the fixing plan. The color palette in addition to being the collection of shades available to the company, is divided into categories and sizes of tiles, is implemented with different features, allows you to get specific information and is prepared to search by color code. 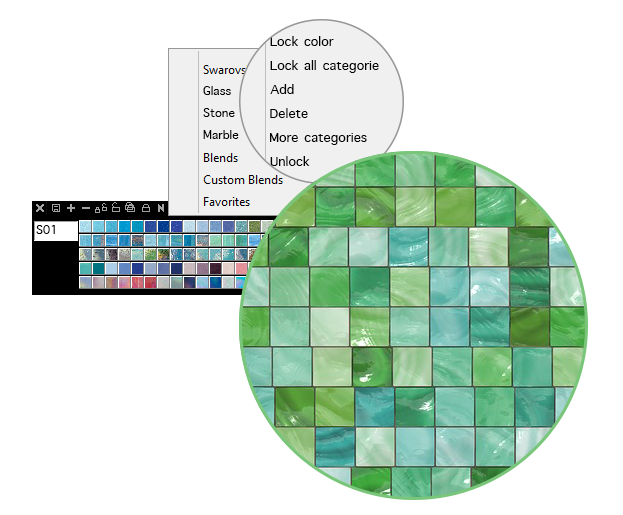 Pattern mode is a function that lightens the timing and manual design of the mosaic design: in a few steps and taking advantage of tiles library already proposed, you create a replicable model for all sheets of installation. A high quality export favors a possible 3D rendering. By integrating multiple blends in the color palette a gradient can be created, for which you can change the percentage of quantity single color in the gradation process and determinate the shade direction. 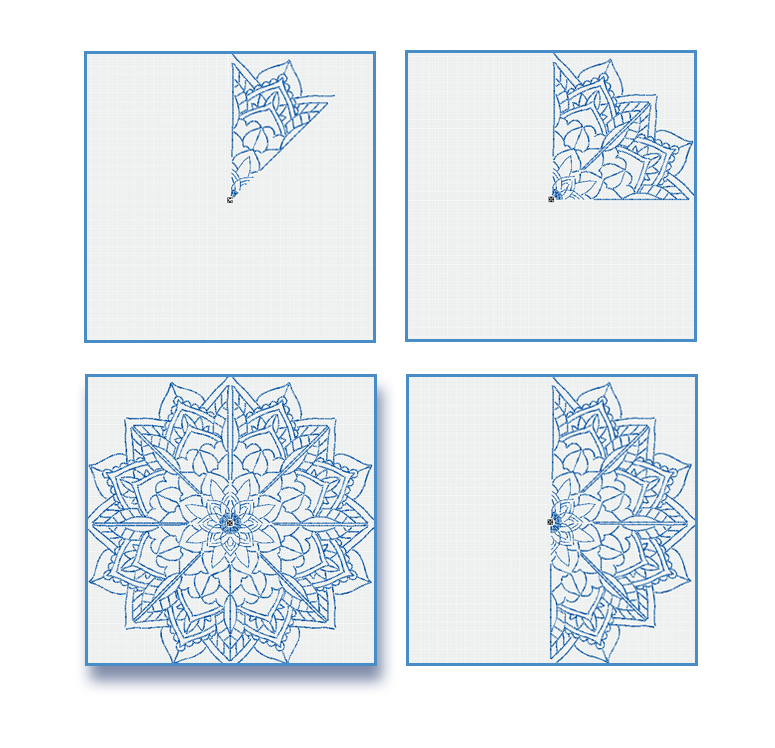 Techniques like mirror, repeat, extract, flip and more functions allows an high speed and dynamicity in the realization of elaborated also complex, as Mandala or Greche. Ready to print: specific information, laying plan, realistic visualization. 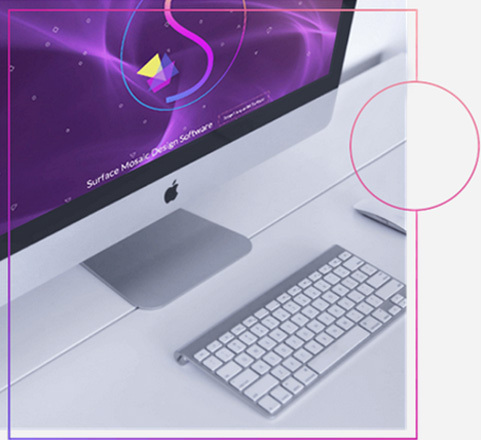 In the design phase Surface automatically stores all the specific information necessary for the implementation in the data register. 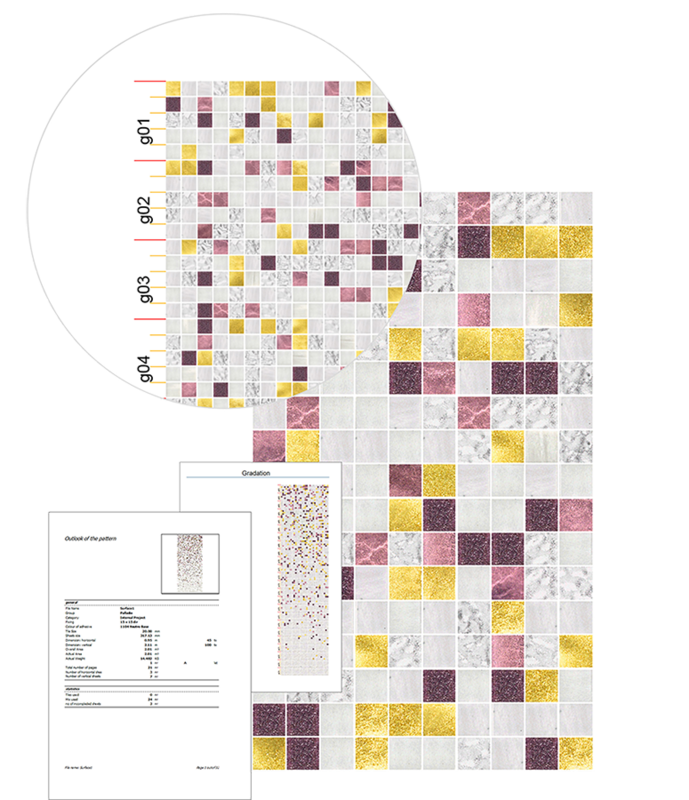 The technical documentation is finished with percentages of colors, codes, laying map, bill of materials and realistic presentation of the design, which will be used for the production and laying of the mosaic, as well as for a 3D rendering. Developed alongside the companies in the mosaic sector and according to production needs, Surface boasts features aimed at fully satisfying the requirements for mosaic processing. Also aimed at developing customizations based on the company's requests. 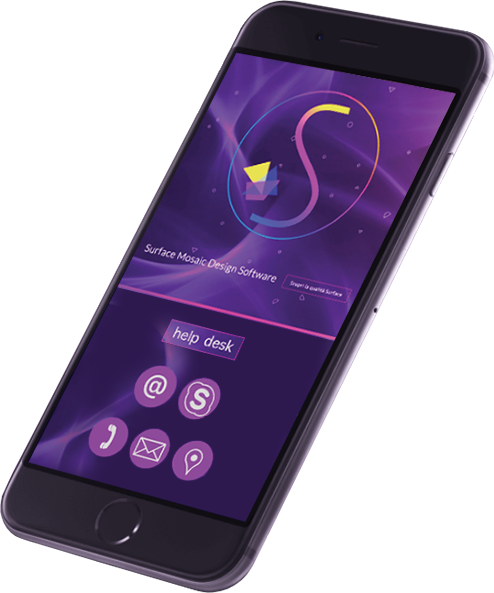 You will be followed in installation and training remotely or on site, and in the eventual assistance for any need.